Traction engines were the tractors of the late 1800s-early 1900s, effectively self-propelled steam engines for the roads that could pull immense loads. Very slowly, but immense loads nonetheless. The arrival of the internal combustion-engined tractor saw traction engine use decline massively, but many do still survive to this day. In fact this TLCB writer passed one close by to TLCB Towers recently that was comfortably towing both an enormous wooden caravan trailer and a Land Rover Defender behind that. Very slowly. This superbly rendered turn-of-the-century traction engine comes from newcomer Bricked1980, and whilst it’s not our normal fodder we absolutely love it! Constructed in LEGO’s newer hues of dark green and gold, Bricked’s model features authentic chain steering, a spinning flywheel, much plumbing accoutrement, and a drawbar trailer full of assorted old-timey stuff. Which it will pull, very slowly. Suggested to us by a reader there’s much more to see of Bricked1980s brilliant mini-figure scale traction engine design at both Eurobricks and Flickr, where you’ll also find a link to the model on the LEGO Ideas platform. This is not a collection of beautifully arranged Danish plastic. Nope. This is a collection of beautifully arranged pixels. Yup, this stunning looking image – the product of three different builders – shows only a render of a virtual model. * But one that looks so unfathomably real that it fooled the whole TLCB office. Previous bloggee Sir.Manperson is the architect behind it and you can see more and read about the collaboration at both his MOCpages and Flickr photostream. *We sometimes get asked why we don’t feature more digital creations. Today’s creation, despite being a digital render, proves our point. Real bricks, even the illusion of real bricks, are where it’s at. Yes, we know, this isn’t made from real bricks, and as such the Elves are a bit grumpy (we’ll be publishing their finds in a bit), but we do only post a digital creation in exception circumstances. And these are exceptional circumstances. Because this Porsche 944 by Sam the First is absolutely perfect. We rarely post virtual creations here at TLCB, but today is Back to the Future Day (the date that Marty travels forward to in back to the Future Part II) so it seems appropriate to go digital! This lovely LDD recreation of Biff‘s Ford Super Deluxe from the Back to the Future franchise comes from Flickr’s Peter Blackert, and you can climb on your hoverboard and head over to view more by clicking here. The Elves are going hungry at the moment, because for the last few days they haven’t found a thing. Luckily for us, you guys have, and so today we have three of your finds. On the left is MOCpages’ Jase G’s ‘Little Bit of Muscle‘, which the Elves would probably like to have found themselves, in the centre is a lovely Town-scale Chevrolet G20 van by a builder known simply as ‘Ben’, and on the right is Yoong Cherng Ee’s awesome looking Nissan Silvia S13 in full time-attack spec. You can see more of each model by clicking on the links in the text, and if you’d like to suggest a creation to us here at TLCB you can do so via FlickrMail, the Submission Suggestions page, or by completing the Feedback form. You can also let us know if you’d like guest blogger status – if your english skills are good your words could appear alongside your find here too! Here at The Lego Car Blog the creations we blog are unearthed by our unpaid and unusual workforce of smelly little Elves, bred especially to find the best Lego vehicles on the net. They’re fed based upon the success of their search and – sometimes – they’re also awarded an appropriately coloured Smartie upon each successfully blogged find. This incredible creation by Digital Dreams therefore gave us quite a headache, because just look at how many cars there are! Luckily for us they’re all digital, and thus if we were feeling really mean the intrepid Elf in question would have only received a digital tube of Smarties. However, so good is this creation that we gave the Elf a choice of Smartie, and ensured the canteen actually fulfilled the recommended Elf allowance of vitamins and iron. So, one happy and – at least briefly – healthy Elf later we have quite a design to show you. This astonishing creation is a 192 car Autostadt tower, inspired by the two real-world versions that Volkswagen have installed at their Wolfsburg manufacturing plant. There are 26,000 virtual Lego pieces in Digital Dreams’ MLCad version that took a colossal 70 hours to digitally render. There’s a huge gallery of images available and you can see all the renderings of of Digital Dreams’ spectacular Autostadt tower on either Flickr or MOCpages. We rarely like fictional cars here at TLCB, and we like even less of them built digitally. This is because most seem to suffer from the same afflictions that blight the endless real-world supercar start-ups from ambitious but naive millionaires; They’ll all do 300mph and have a million horsepower. Except of course that they won’t. Because they’re crap. Our second LDD creation in as many weeks! What’s going on? The Elves are pretty grumpy about this as they don’t like digital creations as a rule. Plus this isn’t even a car, so they’re doubly annoyed. This amazing digitally rendered creation is in fact a 1941 De Havilland Mosquito fast bomber, one of the most important aircraft for the Allies throughout World War Two. Built almost entirely from wood, the Mosquito was one of the fastest aircraft in the world at the time. Not just fast for a bomber, but faster than many fighters too. Digital Lego specialist Peter Blackert (aka Lego911) is the builder, and he’s got a rapidly growing portfolio of famous aircraft on Flickr. You can see more of the Mosquito and his other planes via his excellent photostream. And if you’re of an Elvish persuasion, don’t worry – we’ve got a busy day that’s back to normal cars (mostly) after this post! We often get queries asking why we don’t post more digital creations. 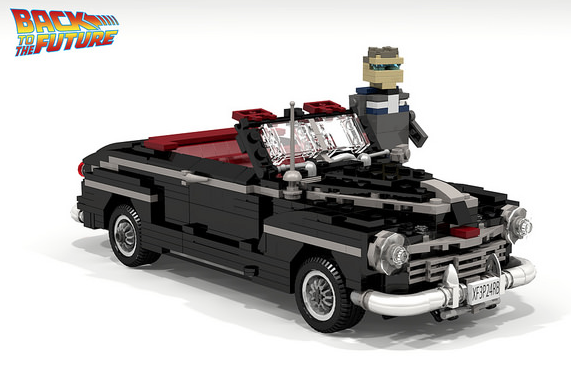 You can read why here, however if you’re wondering what the required standard is for a digital creation to appear on TLCB, look no further than MOCpages’ WoorCK and his beautiful Hot Rod. You can see all the spectacular renders on MOCpages via the link above. Our second creation also takes presentation to the next level, and comes from newcomer Moko on Flickr. You can see more of his superb Town style Hot Rod as well as his other fantastic builds at his photostream via the link above. This incredible recreation of the Helicarrier from the Avengers movie franchise was discovered today on MOCpages. It actually breaks two of our own submission guidance rules, being both not a car and being built digitally. But just look at it! Yo-Sub Joo has painstakingly pieced together 22,694 digital bricks to create a model that if it were real would measure over two meters long! You can see all Yo-Sub Joo’s photos of his awe-inspiring build on MOCpages via the link above. It’s unusual for us to feature MOCs that aren’t built in real bricks on The Lego Car Blog. The Elves prefer something that can be disassembled and used as weapons for beating up their annoying colleagues, something that they can climb all over and into as well. It was with great satisfaction that we heard a “Thump!” as the first Elf who tried to leap into the cockpit of this US Marines AV-8B, fell through the digital bricks and landed on the floor. The we had to get out the airhorn and blast away his co-workers as they tried to pile on top to smush him even further into the carpet. Justin Davies has an impressive catalogue of LDD builds, many rendered to a very high standard, both on Flickr and MOCpages. 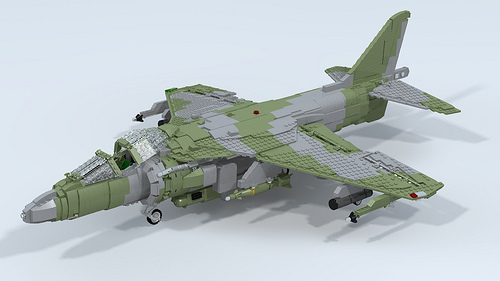 His latest build is a Harrier II, very accurately shaped and complete with the working functions you’d expect such as undercarriage, control surfaces, vectored thrust nozzles etc. It’s worthwhile visiting Justin’s galleries to see the view of the underside of this aircraft which shows how he used different plates to achieve an accurate wing planform. The rear of the fuselage has also been very neatly, smoothly and accurately shaped, including the vertical stabiliser. This Harrier also features a load-out of Sidewinders, rocket pods, LGBs and the cannon pods which form an essential part of the aircraft’s aerodynamics. If Justin’s previous builds are anything to judge by, we can expect to see further versions of this aircraft with a variety of weapons and colour schemes. Justin has also started to put his builds into scenes. The picture below shows an F-4J Phantom II of VF-96 “Fighting Falcons”, hunting for MiGs over Vietnam in May 1972. “Showtime 100” was flown by Cunningham and Driscoll, the first American aces of the war and the first aces to have achieved their five kills using only missiles. 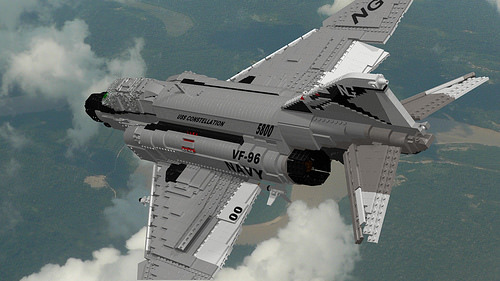 Although the lettering on the MOC has been added afterwards, it does feature a nicely brick-built squadron badge on its tail. You can see more of Justin’s aircraft by following these links to Flickr or to MOCpages. Note: As these are virtual creations, the Elves who found them were rewarded with virtual Smarties, which is another reason why the Elves prefer MOCs to be in solid bricks. Another brave Elf today, which comes back to base with a digital creation. Although we do like ‘old-skool’ real brick builds more, this is a photo that stood out above everything. This is a Hercules C-130 Coast Guard plane, made by mmbace (or Matt Bace, if you are from MOCpages). Making the MOC is one task, editing the image is two. This MOC stands out because of the amazing image of it “in the air”, and Matt’s other shots have a beautiful finish and rendering too. We’ll give this Elf a medal for its braveness, because hey, we do have a new post. Check out all the images on Flickr at the link above.